Then in 2000, an American publisher, Steerforth Press, brought out a new hardcover edition of the book. Now that book is available in nine languages: English, French, German, Spanish, Danish, Greenlandic, Japanese, Korean and even Turkish. In the years since the original publication of Minik’s story, I learned even more of his short and tragic life. Last year I revised the book, and added the new information I had learned. The new and expanded version was published last September with a new title: Minik, The New York Eskimo. It has a lengthy subtitle: An Arctic Explorer, a Museum, and the Betrayal of the Inuit People. Minik’s story is the true story of a young Greenlander, about seven years of age, who was taken to New York with his father and four other Inuit from the farthest northern reaches of Greenland, by the American explorer, Robert Peary, in 1897. Peary’s purpose? To turn them over to the American Museum of Natural History for exhibition. Predictably, four of them died within a few months, including Minik’s father. 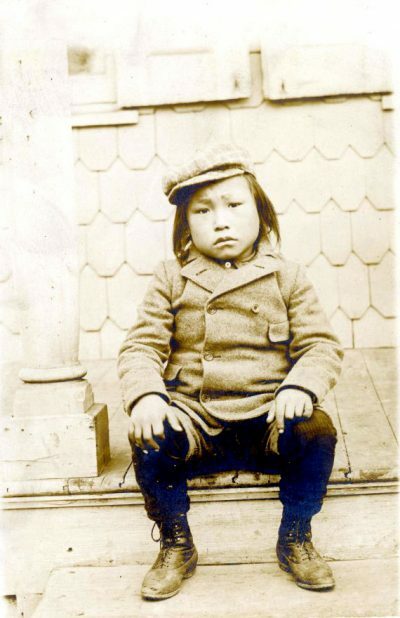 A young male survivor was sent back north the following year, but Minik was kept in the United States for the next 12 years. He lived with the family of William Wallace, the museum’s building superintendent, and received an education. He learned to swim and loved to ride horseback. Most of all, he loved baseball, and he even took up golf as a teenager. Despite his physical activities, he was often ill and in and out of hospital. In 1901 things changed. William Wallace was fired by the museum—he had been caught taking bribes from building contractors. The family fell on hard times. 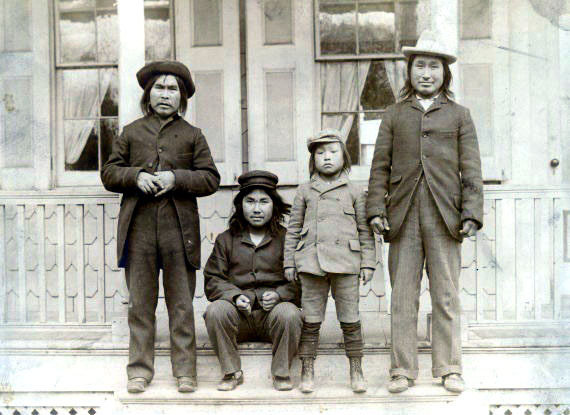 Morris Jesup, the wealthy president of the museum, who had promised to help Wallace with funds for Minik’s education, refused any more help for the boy. Then in 1904 Wallace’s wife, Minik’s beloved foster mother, died. Strangely, Wallace sent his own son away to live with relatives, but kept Minik living with him. But it was now a pauper’s existence. In 1906 things got worse, not financially, but emotionally. Minik learned that his father’s body had not been buried after he died in 1898. Instead it had been defleshed, and the skeleton put on display in the American Museum of Natural History. But how could this be? wondered Minik. He was there when his father was buried. How was it possible that his father’s skeleton could be in a glass case in the museum? The truth was shocking. The museum had staged a sham funeral for the sole purpose of convincing Minik that his father was being buried. The people who Minik had trusted the most were all in on the deception, including the famous anthropologist, Franz Boas, and Minik’s beloved foster father, William Wallace. In fact, William Wallace later provided a description of the events of that tragic night. He said: “That night some of us gathered on the museum grounds by order of the scientific staff, and got an old log about the length of a human corpse. This was wrapped in cloth, a mask attached to one end of it and all was in readiness. “Dusk was the time chosen for the mock burial, as there was some fear of attracting too much attention from the street.… Then, too, the boy would be less apt to discover the ruse. The funeral party knew the act must be accomplished quickly and quietly, so about the time the lights began to flare up Minik was taken out on the grounds, where the imitation body was placed on the ground and a mound of stones piled on top of it after the Eskimo fashion. But eventually he learned the truth and it devastated him. He launched a campaign to have his father’s skeleton released from the museum. That’s where the title of my original book came from; Give Me My Father’s Body was the title of a full-page newspaper article about Minik’s desire to give his father’s remains a decent burial. But he was unsuccessful. In 1909, disillusioned by his life in America, he returned to Northern Greenland. Back home, Minik was like a fish out of water. He couldn’t speak Inuktun, nor did he know how to hunt. But under the expert tutelage of relatives— among them an ancient shaman, Soqqaq, and the renowned Uutaaq, the leader of the group of Inuit who had accompanied Peary to his farthest north—Minik learned fast and well. When another American expedition arrived three years later, Minik was in demand as an interpreter and guide. When I was researching Minik’s life, I talked with a number of elders in Qaanaaq and Siorapaluk who had known him when they were young. One thing that they all marvelled at was how quickly he had relearned his language and hunting skills. But, just as he had longed for Greenland when he was in America, so now he yearned for New York when he was back in Greenland. He returned south in 1916. Two years later he died in the Spanish flu epidemic that swept the world. He was about 28 years old. He is buried in New Hampshire, just south of the Canadian border. October 29 of this year marks an anniversary—the 100th anniversary of Minik’s death. It will be a fitting time to remember and reflect on his life, his courage, and his resilience.